Washington’s Ryan Elrich returns a shot during his third singles match against Chillicothe Tuesday, April 2, 2019 at Gardner Park. 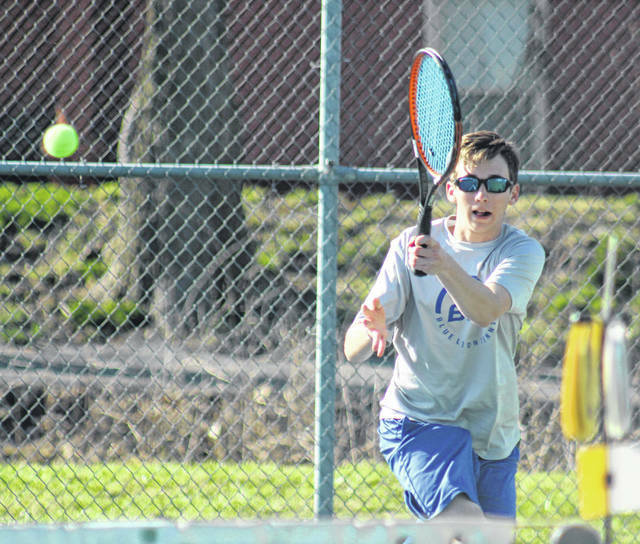 The Washington Blue Lion tennis team hosted Frontier Athletic Conference rivals Chillicothe at Gardner Park on a sunny, somewhat milder Tuesday afternoon. At first singles, Grant Kuhlwein defeated Jonah Halm, 6-0, 6-1. At second singles, Chillicothe’s Garrett Anders beat Blaise Tayese, 6-4, 6-3. At third singles, Ryan Elrich defeated Katie Conner, 6-2, 6-4. At first doubles, Ty Rose and Garrett DeWees topped Silas McDaniel and Reese Hatfield, 6-3, 7-6 (7-2). At second doubles, Sam Schroeder and Olivia Wayne beat Corrine Woods and Haven James, 6-2, 6-4. There was one j-v match Tuesday, with Washington’s Josh Cartwright defeated Darrell Ratliff, 6-4. Washington (2-1 overall, 1-1 FAC) is back in action Monday at Gardner Park against Hillsboro at 4:30 p.m.